We believe that the Bible is God's Word as many Christian churches have historically been confessing all over the world. Worship, evangelism, fellowship, prayer... you're warmly welcomed to participate together with us. If you'd like to find out more about us, please feel free to contact us. 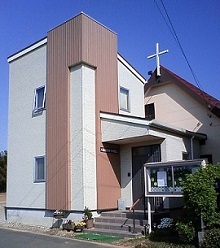 Five members, including the pastor, started "Bible and Music Meeting" at a local community hall in April,2005.In December, 2006, a small church building and then a pastor's house were built with the help ofmany praying supporters, short term missionaries and churches under SEND Mission Juridical Person.